The band restored to a full compliment, One O’clock Jump made the joint jump. Trumpet section work of the highest order, led by Nathan Bray, featured the first of several superb solos from George Hogg. To their left stood Ryan Quigley – the betting was he wasn’t on the gig for the ride. A box of fire works was surely at his feet. MC Long is a fine soloist. He featured in a Goodman trio setting on China Boy – clarinet, guitar and drums. Long also possesses a dry, witty line in repartee. He introduced the boy band singer…the ever-youthful Chris Dean. A tremendous trombone player, Dean could sing alright. The Goodman set flew by…Down South Camp Meeting (cue innuendo from the mischievous Long) and a scorching Sing Sing Sing brought the curtain down on a fine first set. Interval chatter in the bar – a good set, great players…oh, Miller next! Well, don’t knock it ‘til you’ve tried it. Moonlight Serenade – the first few bars, then Running Wild with big tenor from Dean Masser. A further vocal feature for the boy band singer Chris Dean on a well received Stairway to the Stars highlighted Pete Long’s observation that the musicians on stage at the Gala were the same – first set, then second set, yet the sound was different due to their musicianship and the material they were playing. Long’s comment that Miller delivered a punter-friendly sound, and that he was clever in doing so, registered with your reviewer. 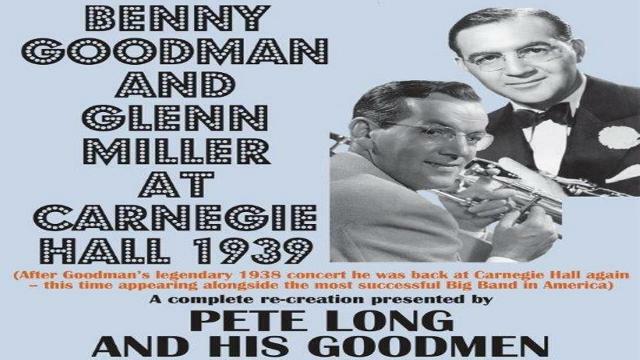 Goodman played jazz, but so too Miller in his own way, with, as Long said, ‘the rough edges taken off it’. Certainly this ‘mature’ Gala Theatre audience loved every tune, be it Goodman or Miller. Discerning? Who cares? In the Mood…walking sticks waving, zimmer frames discarded, they were up – slowly – reliving something or other. A finale heard the same tune twice. Clever stuff from Long. Bugle Call Rag Miller-style, then by way of comparison, the Goodman take. Hear the difference! Hear Ryan Quigley. Didn’t you know he’d try and blow the roof off?! The main man driving, if not conducting, the whole thing, Richard Pite gave a flawless performance. One remarkable feature of this Durham Brass Festival concert…the entire band played acoustically, including double bassist Calum Gourlay! It just goes to show, volume isn’t everything. A rare treat.